Kirpal Meditation and Ecological Center (KMEC) in Pahoa, Hawaii offers a spiritually uplifting environment to heal and grow. Located on the eastern tip of the Big Island of Hawaii, KMEC is very close to the ocean for swimming, snorkeling, and exploring the newly created lava fields. The center is not far from the newest formed black sand beach in Hawaii due to the latest volcano eruption in May 2018. Kirpal Meditation and Ecological Center opened in the summer of 2008 for pre-arranged seasonal meditation retreats and private meditation-vacations on request. Additionally, KMEC extends their welcome to Big Island travelers offering cozy cottages and open-air kitchen and bath. KMEC is an off-the-grid retreat center that can accommodate up to 30 guests on an idyllic 10 acre property. It is situated on ten acres featuring organic fruit orchards with a beautiful Balinese meditation pavilion for prayer and healing as well as the yoga pavilion that can accommodate up to 20 yoga practitioners or a seated audience of 100. KMEC offers a wide range of accommodations depending on your level of comfort and privacy; from a private cabin with its own kitchen and bath, to a simple single bed private cabin including a variety of options in between. All bathrooms have flush toilets and the showers have hot water. Accommodations are simple and comfortable, with no televisions or phones. KMECs largest event space, it has a floor space size of about 20-feet by 40-feet and has about 1000-square feet of floor space. It can accommodate over 100 people sitting or standing or about 20 people stretched out and lying down (i.e. on yoga mats). The Yoga Hale includes its own kitchen and full bathrooms. KMECs Balinese meditation pavilion opens 24 hours a day for prayer, small group meetings, yoga, or solitude. Custom made in Bali, it is a very holy and special place for prayer and reflection. It can accommodate 30-40 people sitting on cushions. It is equipped with a TV, DVD-player, light, cushions, and own independent solar power system. All KMECs cabins can be occupied by one person or two persons (except Milo 1, and Papaya1, each of single occupancy). Our Dragonfly, Butterfly, Mango and Rollinia Cabins can even comfortably sleep up to four persons. Queen bed, plus two bunk beds with Ocean and Lava Field Views. Includes Private Bath. These 20’ x 24’ spacious cabins boast a beautiful screened in porch offering spectacular views of the new lava fields with an ocean backdrop. Queen bed, plus two bunk beds. A lovely octagon cabin, the shared fully equipped kitchen, and two full clean and modern bathrooms, with a great jungle view are about 60 feet away. Queen bed, plus two bunk beds. Elegant and cozy, it will catch your breath from the hustle and bustle in the serenity of this cabin. The shared fully equipped kitchen and two fully equipped clean modern bathrooms featuring a great jungle view are about 60 feet away. Two single beds, two persons. People from all over the world, practicing various yoga styles, have discovered the power of yoga here at Kirpal Meditation and Ecological Center. You will practice yoga with Aloha (love). This will be supporting all those who choose Kirpal Meditation and Ecological Center as a place to go deeper into their body and find the balance they are looking for. With the freeing and empowering experience, you will have on the Big Island will be remembered for a lifetime. Meditation is the act of choosing to go within. For some people, this is simply closing their eyes and breathing while others can travel to the depths of your soul and beyond. The intention at Kirpal Meditation and Ecological Center is to create the space and let you determine the level at which you want to reach. Kirpal Meditation and Ecological Center allows all those who come, no matter what their beliefs, to share in the oneness created. Rachel is an experienced and certified Yoga Instructor with a demonstrated history of working in the alternative medicine industry, specializing in Raja Yoga focusing on breath control and alignment (200 hr). Rachel also specializes in Trauma Informed Yoga (60 hr). She has been teaching internationally and in the United States. Rachel creates a loving and safe environment for her students to grow personally. KMEC is a sustainable community in the center of Hawaiis volcanic and natural wonders. This property was once a papaya farm and is now newly planted with sour sop, jack fruit, pomegranate, rollinia, variety of bananas, figs, passion fruit, mamey sapote, avocados, papayas, sugar cane, coconut, lilikoi, and guava. There are also loquat, cacao, macadamia nut, cashew nut, noni, starfruit, breadfruit, tangelos, grapefruit, oranges, tangerines, lemons, pomelos, and more. The octagonal Balinese meditation pavilion is set among shade-trees with an expansive view of the ocean. The island wildlife is all around KMEC - a variety of birds by day and at night, theres the pleasant chirping of Coqui frogs, and there are no snakes. Natural wonders include Volcanoes National Park, lava and crater viewing, volcanically heated warm ponds directly on the ocean, steam vents (as outdoor saunas), and other wonders of the lush tropics. KMEC is a strictly vegetarian facility. Meaning, no meat, fish, fowl or eggs (both fertile and infertile) can be prepared or stored in the kitchens on the property. Kirpal Meditation and Ecological Center offers guest the use of their community kitchen, fully equipped, plus organic fruit from their orchard when in season. Please note that Kirpal Meditation and Ecological Center provides three meals (breakfast, lunch and dinner) a day included in the prices. They have an experienced chef to prepare your locally grown mostly organic gourmet vegan meals. Natural foods store with takeaway food service located just off the main street in downtown Pahoa. Hawaiian crafts, plants, produce, jewelry, shells, ethnic and recycled clothing, food, live music, records / CDs, and books from approximately 150 vendors. Opens 8 a.m.-2 p.m. every Sunday. Located in Makuu Farmers lot, Keaau / Pahoa Hwy, bypass road. Large, covered, outdoor market with fresh fruits and vegetables, clothing and jewelry, food and coffee booths, music, kava bar, and more. Opens 7 a.m.-2 p.m. every Sunday. Located in downtown Pahoa in the Akebono Theater / Luquins parking lot. Several restaurants in Pahoa are open every day of the week. Delight and help yourself to fresh organic tropical fruit at KMEC spacious and open organic trees property. Any fruits and vegetables grown at the center can be shared. It has curious lava formations from a previous eruption. Quiet, accessible picnic spots on spectacular lava coastline, and not for swimming. Snorkeling at Kapoho Lagoon Reef and tide pools on Kapoho Bay. Pleasant and safe. Surfing at Isaac Hale Beach Park. Also known as Pohoiki, this is an oceanfront park, and surf location along Pohoiki Bay. Recommended for experienced surfers only. Swimming at Black Sands Beach at Kehena. A hard but short climb up and down, swimming could be dangerous. This is a clothing optional beach and frequented by dolphins. Best crater viewing and nature museum. Great lava viewing, best in the evening. No entrance cost. You may engage in individual or small groups of yoga intensives, acupuncture, and cupping. Costs are not included in retreat price but all guests through BookYogaRetreats and BookDetoxRetreats enjoy KMEC retreat rates. Yoga sessions are typically 90 minutes, which includes a comprehensive breakdown of each person needs and short term goals. Please book a flight to Hilo International Airport (ITO) or Kona International Airport (KOA). Kirpal Meditation and Ecological Center provides shuttle service to and from the Hilo airport at 80 USD either way. A shuttle service to and from Kona airport is available at 220 USD either way. KMEC Hawaii is only a 60 minute drive from this airport. Turn left onto HI-11 / Hawaii Belt Road / Kanoelehua Avenue and go about 5.9 miles. Please book a Hele-On Bus, Hawaii County mass transit agency. Take into account the very limited public transportation via the Hele-On county bus that leaves from downtown Hilo. This is a slow, but inexpensive option that comes to Pahoa, if you can coordinate schedules. A pick up from Pahoa can be arranged with KMEC. For more information visit the Hele-On bus website: http://www.heleonbus.org/. Airport: Hilo International Airport Airport transfer available: Hilo International Airport (US$80 per person) Additional charges may apply. You can request this in the next step. Airport: Kona International Airport at Keāhole Airport transfer available: Kona International Airport at Keāhole (US$220 per person) Additional charges may apply. You can request this in the next step. Kirpal Meditation and Ecological Center offers a peaceful and sacred place for yoga and meditation retreats in the wonderful Big Island of Hawaii. Group discounts are available. 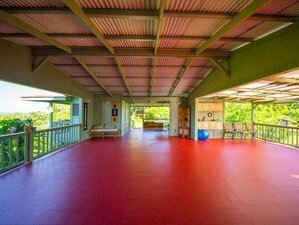 Group organizers are invited to book for their yoga group as Kirpal Meditation and Ecological Center offers lower discount prices for groups of 10 - 15 persons, 15 - 20 persons, and 20 - 30 persons; with and without food, with and without transportation from Hilo Airport, and touring packages as well. For more information please contact Kirpal Meditation and Ecological Center. Shared various accommodations - Includes cabins Milo 1, Milo 2, Milo 3 and Papaya.